The Munich SEO Expert optimizes any page for first-page rankings. You also receive quality traffic, organic conversions, and brand mentions. Jump on board now and give it a few weeks to reach the first page. It takes six months and more to optimize a selection of search terms. Make the most of my ten years in SEO and my unique strategy. The center of my work is about optimizing on-page content. Not interested in buying backlinks or PBNs. I am after quality traffic that generates leads and converts. I use Google Search, Google Maps, YouTube, to get you enough traffic. Think of SEO as a free traffic source. You are welcome to pay for optimizing your site, but you might as well do it yourself. If you are competent, you will get enough traffic, and in that sense it is Free. You might as well hire a consultant like me to do the job for you. When you optimize for organic traffic the right way, it can exceed any other paid traffic. It will get at least six months to have reliable traffic, but it will suffice to get you started. If the results make you happy, go ahead and extend the contract. Some niches need work, so count more than six months. You can let me handle all the specifics and dedicate your time into growing your business. The goal here is to have the most visibility in your niche. I do that by increasing the search terms positions towards the top. Plus, I boost the SEO conversions and time-on-site (reducing Bounce Rate). We want people to click your titles and descriptions and visit your pages. Content is the basis of all optimization. No place for backlinks nor artificial tactics that break SEO. We want quality traffic that converts. I have a unique approach that uses many platforms to generate traffic. I work on providing quality traffic meaning people that need your solutions/products. Nothing to do with bots, and automation software. I reiterate the focus is on getting natural, human clicks. Another thing when a Google update rolls out is that your competitors may lose rankings. My pages run no such risks as most of the time they better their positions. Jump on board now. 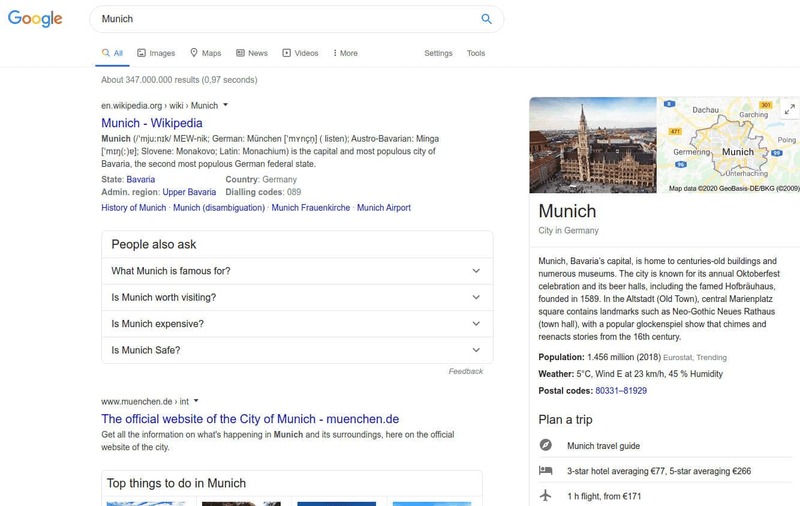 Get top visibility, quality traffic, and leads in Munich. My offer is a unique SEO growth strategy with no risks. Boost your rankings with a reliable, apt, succesful partner.